T BUGS ME when people use air conditioning needlessly. 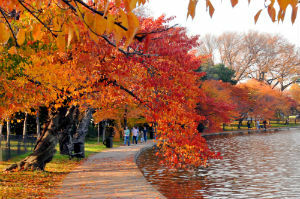 Fall officially arrived last week, and the weather has been quite favorable here in DC recently. My windows have been open continuously for several days, and I have been able to study, pray, and sleep comfortably with nothing more than fresh air and a ceiling fan. Even in the car, riding around with the windows down has been more than adequately comfortable during these days. Walking around campus, though, one hears air conditioners running in in the windows of many dormitories, classrooms, and offices. Not only is this a waste of resources, it means that many folks are missing out on the natural beauty of early autumn weather. That saddens me a bit. Air conditioners, of course, can be a very good thing. Having sweated through many summer liturgies in open air chapels and having tried to sleep while camping in muggy environments, I have no personal vendetta against air conditioning wisely used. But when the weather is inviting, instead of oppressive, my preference is always for untreated air. These are more than meteorological observations. They have bearing on the present state of parish liturgical music. Allow me to draw the analogy. The Roman Rite possesses a native music that is rich, beautiful, and perfectly suited to its liturgical ceremony. This music—Gregorian chant—consists of ordinary and proper elements that are more than simply historical. These chants are integral to the rite. Indeed, the rite developed along with its music, so intimately are they connected. It would hardly be proper even to speak about the Roman Rite and its music as though they were separate entities, for the music of the Roman Rite is part of the rite, itself. The rite and its music are symbiotic. Based on the experience of contemporary parish practice, of course, the average Mass goer would have no knowledge of this music that is so central to Roman worship. For decades, the Mass has been celebrated in our churches with foreign music, to the impoverishment of the liturgy. It is not that the perfectly suited music does not exist. It’s all easily available (now with vernacular versions, free Internet resources, and even video tutorials). It has simply been ignored. The state of affairs is not unlike the hypothetical situation of a person who has been locked up in an air-conditioned room for half a century without realizing that the air outside has been perfectly comfortable all the while. Instead of trying artificially to manufacture the perfectly temperate environment indoors (“climate control”), it would have been wiser for that person to notice and appreciate the perfectly suitable weather just outside the window all along. Instead of forcing foreign music forms upon the Mass, it would be wiser for music directors to become familiar with the chants that belong to the great “treasury” of the Church. In a modern culture that is obsessed with “going organic” with food, one might expect that people would have an inclination toward the natural air conditioning of open windows. Indeed, more often than not, I think that people leave the air conditioning on during beautiful fall weather without much thought. When the air conditioner has been on all summer long, it is easy to leave it running unconsciously, without even thinking to turn it off. I am convinced that most people, if they realized they could do without air conditioning on a particular day, would happily choose to open the windows. This gives me great hope. How so? Because it means that it is reasonable to expect that music directors, if exposed to the liturgy’s native music, will happily choose to use it.